Recently we’ve covered OS X Yosemite up one side and down the other. Read through our guides for installing Yosemite; getting familiar with the new operating system’s design; putting Handoff and Continuity to good use; and learning about changes to Safari, Notification Center, Spotlight, and Mail, Messages, and Calendars. That should give you a pretty fair idea of the changes Apple has wrought with Yosemite. Equipped with this knowledge it’s time to ask the important question: Should I update or not? When pondering the wisdom of updating your operating system it can be helpful to understand what its creator was hoping to achieve with the release. For the last several iterations of the Mac OS, Apple has moved away from a computer-focused digital hub strategy where your Mac held and commanded your data and you attached other devices to your computer to sync its data with them (and vice versa). In recent years, Apple has turned instead to a stuff-centric scheme. In this case your Mac is just another device (although an important one) that has access to your files. What you’re largely concerned with is being able to work with those files, regardless of whether you’re using a Mac, an iOS device, or accessing them via a web browser. The cloud is a key component in that it provides the means for making your data available to all these points of entry, and transparently so. Under Mountain Lion and Mavericks this was evident as iCloud was designed to sync much of the data it had under its control—your email, contacts, calendars, notes, Safari bookmarks, photos, music, and files from apps that once belonged to the iWork and iLife suites (as well as TextEdit and Preview documents). 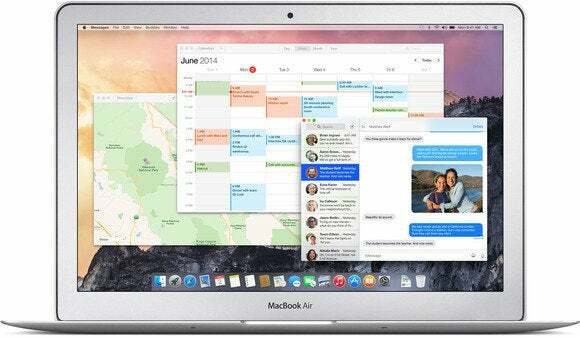 With Yosemite, Apple is further loosening the constraints of computing via two broad efforts. The first is creating an operating system that plays better with data outside Apple’s control. The other is making it easier for you to work with your data on the most appropriate device available to you. Three key elements of Apple allowing you to more easily work beyond its borders are Spotlight, Notification Center widgets, and iCloud Drive. Spotlight: In the past, Spotlight was a perfectly fine tool for searching the contents of your Mac, producing dictionary results, and performing calculations. If you wanted to move farther afield you could select the Search Web For or Search Wikipedia For entries at the bottom of the Spotlight menu, which were little more than Safari shortcuts. 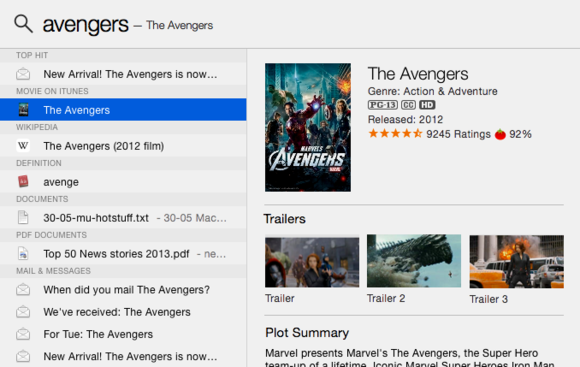 With Yosemite, Spotlight will now incorporate and provide previews of results from the Internet, including Bing search results, map data, news headlines, Wikipedia entries, Apple’s store content listings, and movie showtimes. The net result means more efficient searching and fewer trips to your web browser to find the information you desire. Spotlight can now pull in information from the Internet. Notification Center widgets: In earlier versions of the Mac OS, if you wanted to venture outside the Mac and pull in data from the Internet, you turned to Dashboard. (Or you would have if Apple and developers hadn’t lost interest in it.) Apple still seems to think this is a good idea but wants to make it more noticeable while, at the same time, not shoving these resources in your face. It does so through Notification Center widgets. Open Notification Center, scroll to the bottom, click on Edit, and you see a collection of widgets available to you, including Calculator, Stocks, Weather, and World Clock. These are a fine start, but like the Dashboard widgets before them, Notification Center widgets can be developed by third parties, which could make some very valuable information available to you with a single click. iCloud Drive: Perhaps the most important development in regard to opening the OS is taking the shackles off iCloud file sharing. Much as you may have liked the ability to store your Pages, Numbers, and Keynote files in the cloud, if you wanted to sync other kinds of files—Microsoft Office documents, graphics files, and so on—you turned to a third-party service such as Dropbox, Box.com, OneDrive, or Google Drive. With iCloud Drive this isn’t as necessary as it once was. 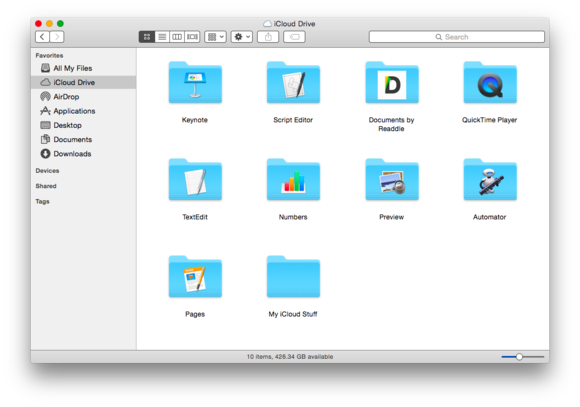 Now you can store files in the cloud that were created by any app—either by moving them from within the Finder via the iCloud Drive entry that appears in a Finder window’s sidebar or through a Save dialog box. With iCloud Drive you can store any file in the cloud. Where iCloud Drive remains incomplete is in its ability to share files with other people (though Mail’s Mail Drop feature can serve as a workaround for files up to 5GB in size). For this reason we shouldn’t expect Mac users to abandon other syncing services in a rush. But for those who don’t need to routinely share files, a file-agnostic iCloud Drive makes for a more open cloud strategy, and a greater convenience for Apple’s customers. With the release of iOS 8, Apple introduced the first element of a computing environment that stressed moving appropriate tasks between devices. The idea being that when you have the opportunity to complete a task more easily on a device that has recently become available to you, you should be able to do so without a lot of fuss and bother. This is what drives the Continuity and Handoff features. In one instance you can start working in Pages on your iPad, for example, and then quickly pick it up on your Mac by “handing off” the open document from the tablet to the computer. 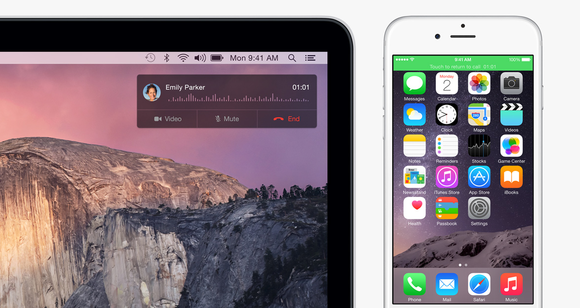 In another case you can use your Mac to answer incoming calls made to your iPhone. One of Yosemite's main advantages is its ability to share tasks between devices. There will always be times when your only choice is to work on your iPhone, iPad, or Mac simply because that’s the only device at hand. But when you have multiple options—and many of us increasingly do—this opens avenues for working more efficiently. In the particular case of Continuity and Handoff on the Mac, a key benefit is the integration with the iPhone. Not only can you answer and make calls to a linked iPhone, but also easily use the iPhone as a hotspot when you don’t have an available Wi-Fi network (this requires a tethering plan with your carrier), and the ability to reply to incoming SMS messages. Of course if you’re also the kind of person who starts long email messages on the iPhone and are frustrated by its small keys, having the chance to pass that message off to your Mac when you’re within range of it will also be beneficial. Again, these two broad efforts indicate a direction Apple is headed—the way the company thinks about the future of computing, which is increasingly mobile and integrated. Contrary to past fears, OS X hasn’t been replaced by iOS (nor the other way ‘round) but rather Apple seeks to find the best use for each, with the cloud providing the glue that holds them together. If you’re the kind of person who is suspicious of cloud computing or simply want each device to exclusively own the data on it, Yosemite may not be for you. Then again, Mavericks and, perhaps, Mountain Lion, probably weren’t either. Apple’s been building this bridge for a long time. Nothing prevents you from opting out of the cloud, but gaining the full benefits of today’s media and technology is going to become increasingly difficult (and less rich) without it. And then there are the littler things that too-often garner the greatest attention when a new operating system is unleashed. In this particular release there will be people who object to Yosemite’s new “flat” look. Gone are the 3D elements of old—the Dock that presented objects on a shelf, the bubbled buttons, the shadows. The system font has been slimmed down and translucency is more evident, used by default in Finder window sidebars and in the dock. Within the Accessibility system preference, you can make the interface more opaque by enabling the Reduce Transparency option and make text more legible by switching on the Increase Contrast option, but other than that there’s very little you can do about the new look. If, after all this time, you still hate iOS 7’s design, you’re unlikely to be happy with Yosemite’s interface. Modern or jarring? Only you can judge Yosemite's new interface. That said, one of Apple’s great talents is creating designs that, while being a little jarring on first glance, make the previous design look outdated. Fortunately there are plenty of examples of Yosemite’s interface in the form of screenshots floating around the web. Explore them and consider just how averse you are to change. My guess is that you’ll adapt fairly quickly. And then there’s the “ready for primetime” consideration. As operating systems become more complicated and rely on pieces outside the confines of the computer (meaning, in this case, iOS and iCloud) it seems that version 1.0 releases are not nearly as stable as the version they’re replacing. Much as we wish it were different, we should accept that there will be problems with a brand-new Apple operating system. (And Windows operating system. And Android operating system.) Yosemite will be no exception. I’ve long been a proponent for creating a setup so that you can dual-boot your Mac. On one partition or hard drive maintain the operating system you currently have along with all its apps and documents. On another, install the new OS and start living with it. When you encounter problems (as you likely will), gauge their severity. Are they mere annoyances? Perhaps you can put up with them until a fix is issued. Do they prevent you from getting your work or play done? Your best strategy may be booting back into Old Reliable and waiting for the inevitable update that adds the improvements you’re looking for. So is it worth your while to dive into Yosemite now or not? The ideal candidate for this update is someone who embraces Apple’s vision of the future. You own modern Apple devices and see the advantage of easily passing data between them. You’re unafraid of storing and syncing data in the cloud (you even appreciate its convenience). You like the idea of your Mac being able to pull in information from the Internet and present it within its search utility. And you’re willing to give a new interface design a chance. If, on the other hand, you prefer doing things as you did in the past—sync your data locally, have less interaction between your Mac and iOS devices, work with an interface you’ve grown to love over the better part of a decade, and go to sleep knowing that your Mac is going to behave tomorrow just as it did today and six months ago—there’s no shame in leaving your Mac exactly as it is.